Our family have just returned from spending a week staying at the Ramada Port Douglas (QLD) resort, over the Easter break. We have been WorldMark South Pacific Club by Wyndham Owners since 2011 and since joining have stayed at several different resort: Wyndham Seven Mile Beach in Hobart (TAS), Wyndham Resort & Spa Dunsborough in Margaret River (WA), Wyndham Coffs Harbor – Treetops (NSW), Wyndham Kirra Beach in Coolangatta (QLD), WorldMark Resort Ballarat (VIC), Ramada Phillip Island (VIC), Wyndham Torquay (VIC), and Wyndham Resort Denarau Island in Fiji. From the moment we arrived at Ramada Port Douglas, we were made to feel like exclusive guests, the excellent level of service is given to all guests the moment they arrive at the resort. Staff member Donna showed us to our Two-Bedroom Deluxe apartment, then took the time to explain the room facilities, discounts we had available to us when booking tours through the resort and explained the basic layout of the resort. She gave us informative information on places to see and things to do during our stay. 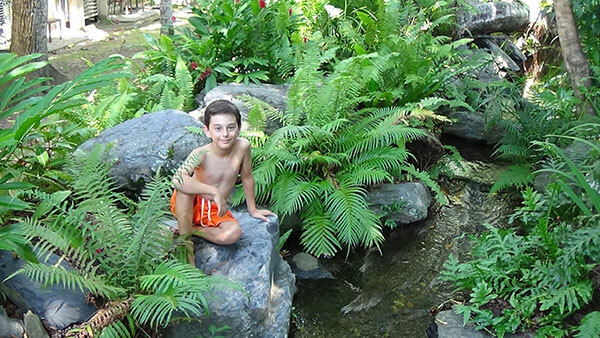 When walking through the resort, one is overwhelmed by the artificial river system that extends from the foyer to the swimming pool at the rear. Complete with cascading falls, tropical plants, yabbies’ , small fish, frogs, tadpoles, and barramundi. Walking towards the pool, one can’t help thinking that they are walking through a tropical rainforest river oasis, instead of a resort. The resort pool is set out to represent a rainforest swimming hole, complete with pool side restaurant. Guests can also take a seat in the pool and enjoy a cocktail from the poolside bar. With such great service, lovely accommodation, a rainforest feel, guests could spend their entire holiday without leaving the resort. The Owner Update was extremely informative and my wife and I received a thorough explanation on how to use the Wyndham travel agents (Travel Club by Wyndham) and website to make the most of our Vacation Credits. At the same time, our children were kept entertained watching TV, playing games and colouring. Having hired a car our family, with friend Rosa (who was staying and travelling with us for a few days), spent several days out travelling around sightseeing and enjoying the local swimming holes. We travelled north across the Daintree River to Cape Tribulation. On the way, we were privileged to see a cassowary casually crossing the road. After walking along the beach at Cape Tribulation, we stopped for a much earned cool-off in Masson’s water hole, complete with crystal clear water teaming with fish and rope swings. The kids had a ball. There is also the Rainforest Treetop Walk which is well worth doing. On our return, we stopped for an ice cream which all of us highly recommend. Although choosing one of the twenty six different flavours available can be difficult. 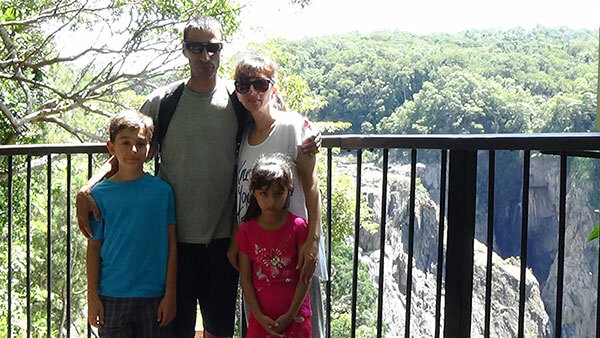 Another day was spent driving to Kuranda and seeing Barron Falls. Our family had already travelled on the Sky Rail on a previous trip, which is well worth doing at least once. 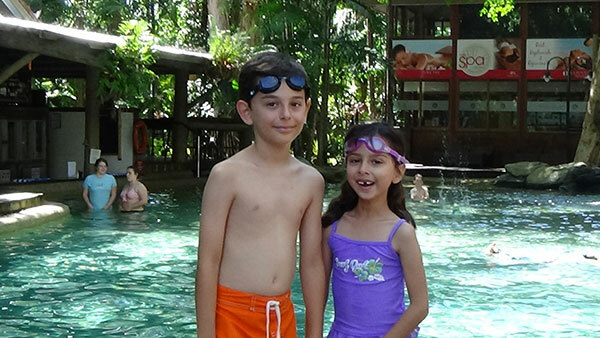 We then took the children swimming at Crystal Cascades near Cairns, both a great place to swim and a nice place to cool off from the tropical heat. Then we returned to the resort to enjoy a family dinner at the pool side restaurant. Atherton Tableland was next, stopping at Atherton to visit Crystal Caves. A private collection of rare crystals, collected over a span of forty years. An amazing array of crystals are on display to the public. The wife and kids also loved the interactive cave display. Of course the day couldn’t end without the kids and dad going for a swim at Lake Eacham. The last day of our trip was spent at Green Island. My eleven year old son Thomas and I would spend time snorkelling, while my eight year old daughter Vanessa and my wife went viewing the aquatic marine life from a glass bottom boat. Coral trout, clown fish, sea turtles are just some of the many marine creatures seen. Green Island is a nice way of exploring the Great Barrier Reef without breaking the family budget. 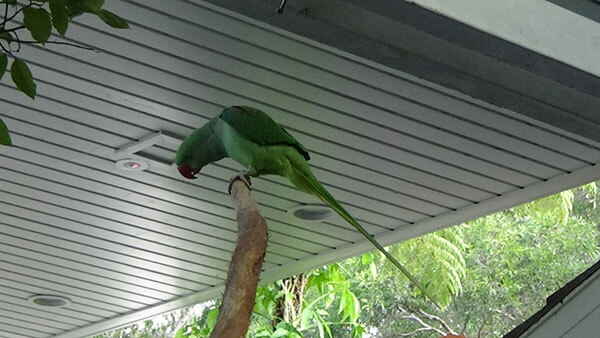 Finally my family would like to wish all the staff at Ramada Port Douglas (along with their mascot Skittles the Alexandrine parrot), a big thank-you for making our stay there such a pleasurable one. This entry was posted in (QLD) Port Douglas and tagged australia, family, holiday, Port Douglas, port macquarie, queensland, timeshare, travel, vacation ownership, WorldMark South Pacific Club by Wyndham, Wyndham Vacation Resorts Asia Pacific. Bookmark the permalink.